In this Startup Savant interview, Jennifer Chase shares her journey as the founder of Frugi Home Organizer LLC, a Home & Business Professional Organizing company. She operates her business through helping and partnering with other startups to create an easy system while earning an extra income. After you absorb her entrepreneurial insights, be sure to follow her on Twitter to get a closer look at how to run a frugal, debt-free business. As a new inspiration of mine, Jennifer takes the definition of what it means to be a savvy entrepreneur to clever heights. Learn to operate your business with no debt, don’t spend like you already made it and daily goals. Can you tell me a little bit about Frugi Home Organizer, LLC? When did you first get bit by the entrepreneurial bug? I got bit by the Entrepreneur bug very early! Operating my first lemonade stand when I was 8 yrs old, I figured out I could do this forever! Frugi Home Organizer, LLC is a Home & Business Professional Organizing company started in Colorado. Partnering with other entrepreneurs looking to start & operate an easy business system & earn extra income. We serve Home Owners & Sellers, and work closely with Real Estate Agents/Brokers throughout Colorado. What does Frugi Home Organizer, LLC do that makes it better than the rest? In other words, how did you find your competitive edge? No Inventory, No Directors, No Recruiting, No Pyramid Scam, No Selling, No High Start-Up Costs. That’s how! Frugi operates like a franchise, not Direct-Sales. No one goes deep in debt, or deep into ridiculous inventory. We operate lean, frugal. Fantastic! I read. Every day. I read about other successful entrepreneurs, I read about business information, I read about success, I read great stories, I read every day. Successful people read! I’m always learning how to better myself, my company, my life. Reading is one of the most important things you can start today in order to be successful in whatever you do. Put it on your schedule every day to read. Did you run into any roadblocks when writing a business plan for Frugi Home Organizer, LLC? Are there any tools or resources you used to simplify the process? A Business Plan must be flexible. So many of us write a Business Plan and think we have failed if we don’t reach those goals or miss marks. Business Plans must be fluid and ever-moving, ever-changing in any economy and in order to be profitable. Don’t be afraid to change the plan, sometimes daily! Remember that a Business Plan is the laying of the foundation, but it must not become concrete. Debt. Debt destroys a business. It has been the biggest mistake I have made in any business. Debt is not the answer, it is not the key, it is not the way to go. Learn to operate your business with no debt and that is where true profit begins and grows. I only operate Frugi Home Organizer debt-free and I encourage all our partners to live debt-free. Both. But I know my numbers and know the spreadsheets. Educate yourself and know your numbers! Financial Freedom feels amazing! I get up every morning to continue to live in it! I am passionate about helping others live in financial freedom and live the lives they dream! I love offering my five boys a wonderful life! My motivation is other people. They need me, I need them. Snooze Button OFF. “Simple Start-Up: How to Start a Home-Based Business. Simply” by Jennifer Chase! It’s a MUST READ for all small business owners in any industry to be a success! I take my own failures in business, honestly, and tell you what to do instead that have worked personally and professionally for me. Available at Amazon.com. 2. Don’t spend like you already made it. 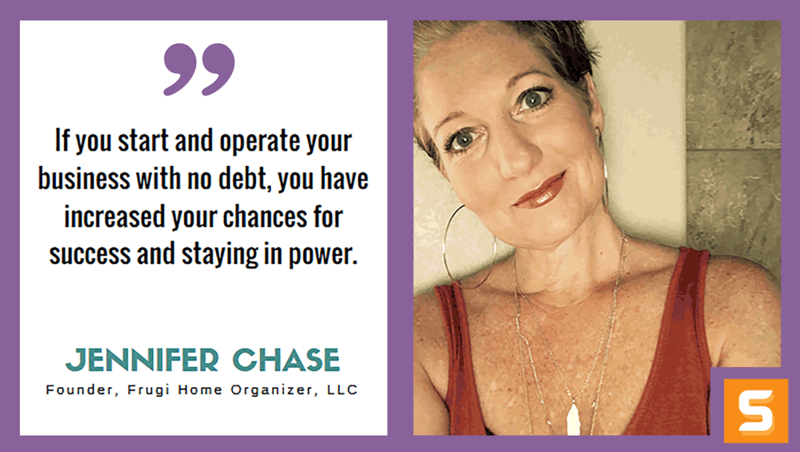 If you start and operate your business with no debt, you have increased your chances for success and staying in power. If you don’t spend like you already made it, live and spend frugal in everything, then it gives you a better chance of making it! And when you do make it, it feels better! You know it’s real! Daily Goals is so cliche, I know, but it’s how you make sure you are spending your time on what is important and needed to be accomplished today. Daily Goals allow us to see how far we have come and where we are going. Go for it! Start Up Colorado! For advise on how to start a business in Colorado, you can contact me at Info@FrugiHomeOrganizer.com.